I'm wiring the new workshop and want to use 3 way switches to control four outlets running across the ceiling for plug in lights. Right now, each switch is functioning like a single pole, turning on/off the string of outlets rather than controlling the outlets as intended. Power comes into the first 3-way; Red traveler is continuous from first to second switch; black traveler runs from first switch, ties into each outlet, and ends at second switch common; white neutral comes from power and ties into each outlet; white wire is used as hot wire from last outlet to second switch. Where did I make the mistake? Thanks for the help. The "white" side of the outlets should never be connected to the switch. The white you have connected to the second switch is actually playing the role of another black wire. Look at the diagram below. The white wire going to the switch has a black stripe of electrical tape to mark it. 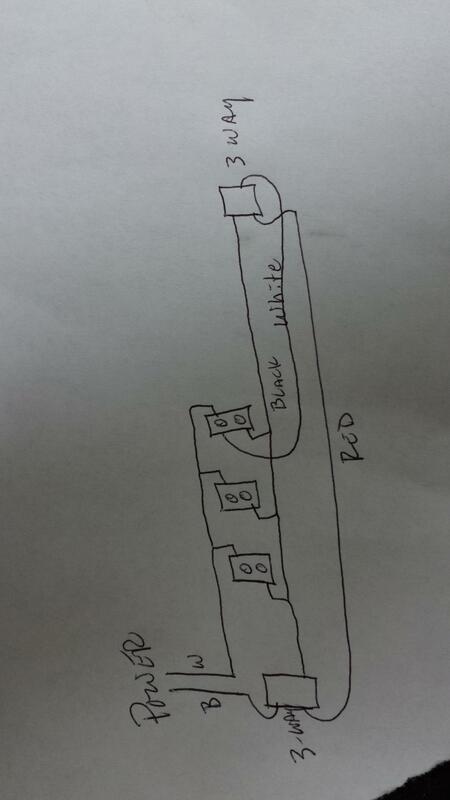 That white wire is never connected to the lamps (which are the outlets in your diagram). Both travelers (Red and Black) must be continuous from the first to the second switch. Then from the second switch you would connect the non-traveler (now the switched wire) to each outlet. If the outlets are along the path of the travelers then that means that each outlet will have 4 wires (+ground): the neutral, the switched wire and the 2 travelers. red and marked white = traveler. current code also requires you to pull the neutral to the second switch (left capped off if not used) as future proofing for when you want to connect a timer or motion sensor. Not the answer you're looking for? Browse other questions tagged wiring switch receptacle or ask your own question. How do you wire multiple outlets between three way switches? Can I run constant power and a three-way switch with three conductors? Can I wire a 3 way switch to a light but also have an always-hot receptacle? How should my new outlets be connected to this circuit? Adding double gang switch for two different lights? Add a light switch to an existing switched outlet?